❥SMALL LIGHTWEIGHT DESIGN EASY TO TRAVEL WITH❥Bluetooth speakers selfie stick small and easy to travel with,This is very handy selfie stick bluetooth speaker, easily portable with carabiner to bring it wherever you go,hang to your backpack or handlebars,it feels great in the hand, it is so user friendly,the seamless aluminum body provides worry-free protection and high end quality.Weights only 270g. ❥FREE YOUR HANDS,PHOTOGRAPH,LISTEN THE PERFECT MOMENT❥Advanced bluetooth4.2,Fast bluetooth connection with 33 feet range,Auto connection ever after first pairing,It is a bluetooth audio player supporting A2DP,AVRCP.HFP.Pairs with all devices with bluetooth function.An ideal gadget for your family gatherings,graduation,nights out,hiking trip,holidays and so on. 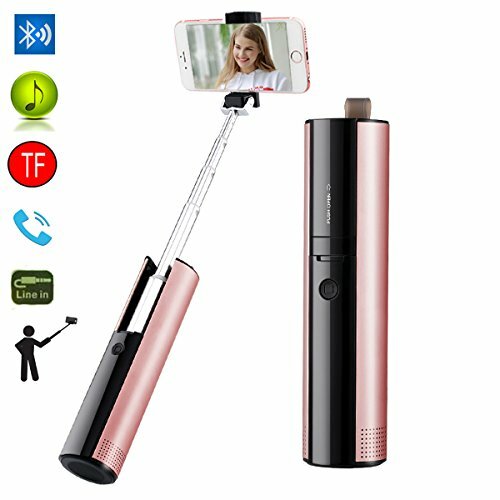 ❥keep you entertained❥Bluetooth speakers selfie stick large capacity battery keeps your music going through the night,a single battery charge prvides up to 10 hours of continuous playback to keep you entertained,delivers crisp sound,with dual stereo speakers that provide 360degree omni-directional audio,A Mobilephone holder enjoy your movie. ❥100% SATISFACTION GUARANTEE ❥Guarantee service and reliable customer service within a 24 hour time support, 90 day back money guarantee - 12 month warranty. If you have any questions about this product by CLEVERLOVE, contact us by completing and submitting the form below. If you are looking for a specif part number, please include it with your message.